FABRICATION: A Conference Examining the Digital Practice of Architecture | Williamson Williamson Inc.
Shane Williamson co-chairs “FABRICATION: A Conference Examining the Digital Practice of Architecture,” the 23rd Annual Conference of the Association for Computer Aided Design in Architecture (ACADIA), the American Institute of Architects (AIA) and Technology and Practice (TAP). The FABRICATION conference was held November 11-14, 2004, at the Faculty of Architecture, University of Waterloo and the Faculty of Architecture, Landscape and Design, University of Toronto. Workshops, tours and exhibits of new rapid-prototyping machinery and European building technologies complemented professional presentations and refereed research papers. Featured speakers included Mark Burry, Cristian Ceccato, Chuck Eastman, Siamak Hariri, and Lars Hesselg. Shane Williamson, Nancy Yen-Wen Cheng, and Phillip Beelsey, ed. 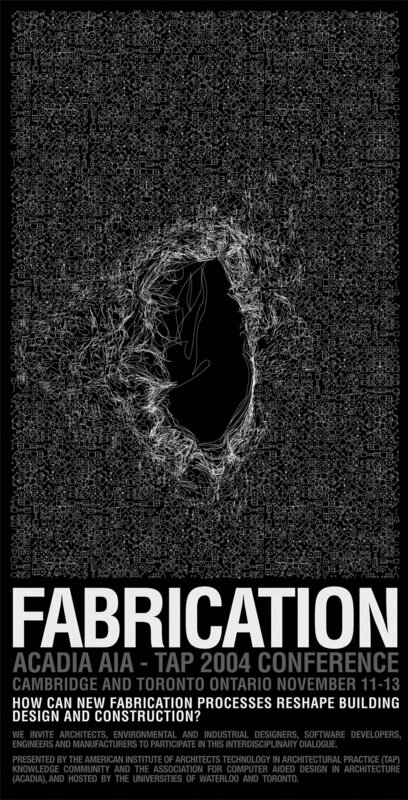 Fabrication: Examining the Digital Practice of Architecture. Proceedings of the 2004 AIA/ACADIA Fabrication Conference, Toronto: Coach House Press; 2004.